Grover Beach police arrested an Oceano man on Thursday who was in possession of heroin and methamphetamine while prowling around homes. At the time of his arrest, the suspect was supposed to be attending to three young children. Around 1:35 p.m., a citizen reported a suspicious man who was prowling between homes, peering into parked cars and entering backyards in the 200 block of North 6th Street, according to a Grover Beach Police Department news release. Police found the suspect, 22-year-old Anthony Ishmael Farley, in the area and questioned him about the prowling. Officers determined Farley was in possession of heroin, methamphetamine and drug paraphernalia. Police also learned Farley was supposed to be caring for three young children ranging in age from 1 to 4 years old. Officers found the children, who were not related to Farley, unattended at a home in the 500 block of Saratoga Avenue. 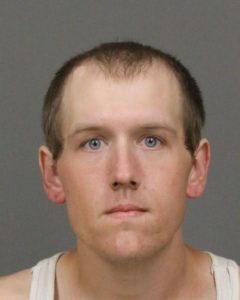 Police arrested Farley on charges of child endangerment, prowling, possession of heroin, possession of methamphetamine and possession of drug paraphernalia and booked him into the San Luis Obispo County Jail with his bail set at $100,000. While waiting for Child Welfare Services to arrive, police fed the hungry children, according to police. Child Welfare Services personnel then took the children into protective custody. Grover Beach police say the case shows how valuable it is for citizens to report suspicious behavior when they witness it. The three young children were rescued from a dangerous situation as a result of a witness reporting the incident, police say. Investigators request that anyone who has additional information about the case call the police department at 805-473-4511. The article doesn’t say if the mom was home or not. She could have been passed out from being up all night on drugs. The boyfriend probably thought no one would notice if he just ditched out on the kids to go get his afternoon fix and steal some stuff while out. Why not leave your kids with a meth head junkie in a wife beater t shirt? Nothing bad could happen. Maybe it was Take Your Children to Work Day. Maybe Ishmael was looking for the white whale!! What the? How low can people go? Add to the story the mom of the 3 children who had to know this guy was a drug addict and not fit to watch children. CPS needs to get involved for sure. That actually makes sense. Anytime meth or heroin are involved–the choice between responsibility (or even family) is always going to be the drug. On the news yesterday was the toddler (12…18 months old) who was found dead and stuffed into the couch at her mom’s and grandma’s crack house. Like I said….the drug always is first.